You couldn’t stand it any longer. All the dreaming of epic hunts on your property from the comfort and luxury of a tower blind was just too much to handle, so you finally bought a brand new box blind. The adventure is just beginning for you, as there are many benefits to hunting from a box blind (e.g., shelter from the weather, better scent control, can get away with more movement, etc.). But before you get to enjoy all those perks, do you know how to set up a box blind? If you’re hearing crickets chirping in your head, here’s what you need to know about how to set it all up and how to raise a blind. First, make sure you read your entire instruction manual that came with the blind, and follow all safety recommendations at all times. Before you set up a box blind, you should decide where you are going to put your new tower. Box blind placement is so critical for several reasons. First, you presumably want to see deer and be able to hunt them from your blind, so putting it in the right location makes a difference. Second, though not particularly complicated, setting up a box blind does take much more effort than simply moving a climbing tree stand to another tree. That’s why you need to try to nail the spot the first time. Setting it up near a food plot is almost always a good idea, provided you have a good access trail and can sneak in and out without being detected. Hunting over food sources is a proven way to see deer, but it’s especially useful when hunting mature bucks in the late season months. Sitting in an insulated box blind, you can easily wait out the late season cold weather until a reclusive (but hungry) buck finally steps out to feed on standing corn or beans. Situate the blind on the downwind side of the food plot or field, with the shooting windows facing the direction you expect to see most deer. Always keep the ladder on the back side so you can sneak into and out of it. It helps to have some kind of cover to hide your approach too, whether that be a spruce windbreak, a messy field edge, or some tall grasses you planted for screening cover. You will definitely need to be able to transport your Muddy® box blind and the deer stand base to the field using a large trailer or tractor. The blind comes completely assembled so you don’t have to worry about how to set up a box blind itself. But you will need to assemble your tower kit, whether you choose the 5- or 10-foot option (depends on availability at most Muddy® blind dealers), before you can raise the blind. Depending on where you set your box blinds up, it may be easier to assemble the tower kit at home. At least you have all the necessary tools there and the mosquitoes, flies, and ticks shouldn’t be as bad as they would be in the field. In addition, finding dropped nuts and washers in your garage would be a lot easier than on a field edge! After assembling your tower kit per the instruction manual, you basically have two options when installing a box blind. 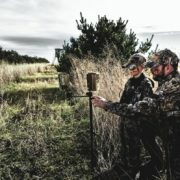 As for the best way to raise a box blind, it really depends on your own preferences, what equipment you have, and how many people who can help. The first option to set up a box blind is to tackle the two pieces separately. Choose a level area and set your tower kit upright – two people should be able to lift this up into place. The base should then be leveled and staked down to provide a solid structure on which the blind will sit. If you don’t know how to level a deer blind, simply place a level on all the horizontal beams you can. Try excavating with a shovel beneath the legs to adjust the ground surface until everything looks completely plumb. Then pound the rebar stakes into the foot pegs of all four corners and the ladder as well. Find the very center of the base by tying some ropes from corner to corner – where the two ropes cross is where you should twist the auger stake into the ground until the loop hole rests on the ground surface. At that point, use wrenches to turn the turnbuckle loose while still keeping the two ends connected. Attach the bolt and clevis to the auger stake loop, and attach the wire to the loop-end of the turnbuckle. Use the clevis to tighten the excess wire and secure it. Finally, tighten the turnbuckle by turning it clockwise until the wires are taut. Now the structure should be very solid. At this point, use a tractor to lift your Muddy® box blind up and place it on top of the base. Before doing so, make sure everybody is clear from the surrounding area, and ensure nobody is underneath it! Obviously, you should also make sure the door is located on the ladder side. Once the blind is resting on the base, attach them to each other and double check all the connections are secure. You will likely need to retighten the cable attached to the auger stake once the blind settles the tower a bit. The other option to set up a box blind is to attach the blind to the tower kit on the ground, and then team lift the whole thing up into position. As with option #1, make sure the spot you choose is a level area and in the right spot. Lay the tower kit and blind on their sides, and arrange the base of the tower to be exactly where you want to lift it up. Then, attach the blind to the base using the proper tools. About 10 to 15 feet away and 45 degrees from the base (towards the blind), drive two of the rebar stakes into the ground. Attach support straps to them from the foot pegs touching the ground. This anchors the base to the ground, which will allow you and your team to safely lift the blind into position without the base kicking out from beneath you. Using your team and safe lifting practices (lifting with your legs, not your back), slowly raise the full blind and tower kit up until it settles into place. At this point, you should go through the same leveling and staking steps as listed in option #1 above (i.e., level the tower, drive the foot peg stakes into the ground, attach the auger stake to the cable, etc.). For the full instructions for each of the options listed above, check out the video below. After you set up a box blind, you’ll probably feel like you can’t wait to get out on your first hunt. But don’t let the excitement get the best of you. Remember that you should always check the connections and ensure the tower is stable and safe to use before climbing into it. The ground may settle and the wind may shift it slightly, which can loosen the cables or foot peg stakes over time. Always keep safety in mind when using any elevated hunting platform. If you’ve been keeping an eye on Muddy® blinds for a while now, but weren’t sure how to raise a tower stand, we hope this explains it for you. Early season hunting isn’t that far away now, so it’s time to start thinking about how you can incorporate one of these blinds into your hunting strategy.